Heads Up — New Hub Design Coming Soon! I’m super excited to announce that the Hub will be sporting a brand new look later this week! Our primary goals with this redesign are to remove ads from the main content area of the Hub and improve the overall reading experience. We also want to give more real estate to Hubbers, like we did with the mobile design roughly a year ago. Because this will be the first iteration of the new design, we plan to do a few weeks of testing afterward to see how the changes are received by HubPages’ readers. Consequently, the first version will not be permanent and we’ll likely be making refinements based on the data we collect after testing. We would also love to get your feedback on the new design, so make sure to share your thoughts in the announcement forum later this week! The sidebar will be widened so that the main body of the Hub is 970 pixels (from 728 pixels). The author section will be more prominently displayed at the top of the new sidebar. If you provided it, your real name will be displayed beside your username (like on mobile). Your avatar will also be much larger. A More by the Author content module will be displayed below the first ad in the sidebar. It will look similar to the Hub of the Day module in the Feed and will feature one Hub. 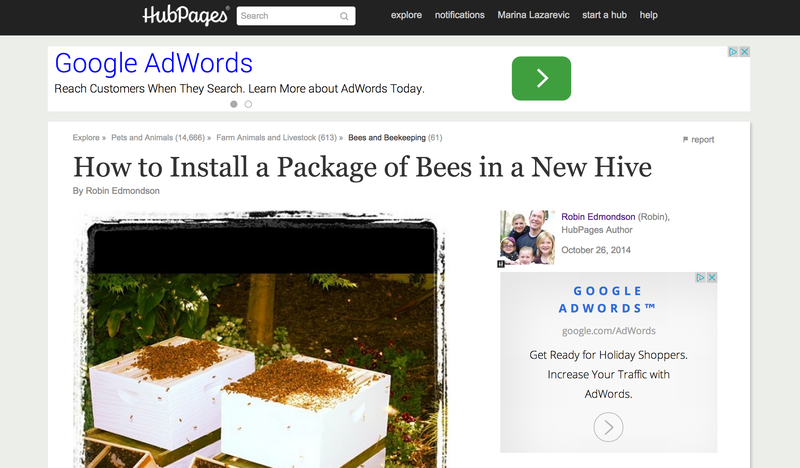 A Recommended Content module will be displayed below the second ad in the sidebar. The Hub title will be enlarged and span the width of the entire content area. The Breadcrumb structure on subdomain Hubs will be reverted back to how it was before September 2013 — it will direct readers to HubPages Topic Pages rather than a filtered view of your Profile. Ads will be removed from the main Hub content area. The Related Searches unit in the sidebar will be removed. The new sidebar will have three 300×250 ads (separated by the content modules above), two of which will anchor as the reader scrolls down the page. There will be some new ads below the main Hub content area. The new sidebar will have two 300×250 ads (separated by the content modules above), one of which will anchor as the reader scrolls down the page. There will be one 520×280 ad below the main Hub content area. The social buttons will remain anchored as the reader scrolls, but they’ll be displayed horizontally. Looks great! I’m so glad that the related searches will finally be removed. It does look interesting Marina. I am willing to try it and compare it to the present layout to see which Hub, or parts, is/are better/worse. I suggest having a survey, if that is not already in progress. When it came out and I searched for the social buttons, I was searching inside of the Hub (left side) and not the outside. Huge improvement in user experience. Hopefully this will bring page views back up. Sounds like their are some interesting and helpful changes coming. I’ll look forward to seeing the new layout. I forgot to mention that I like that graphic that displays at the bottom with the swirled lines and little hearts. It would be great if a similar graphic was available to use for our hubs a nice touch! I feel very strongly that a “Recommended Content” module needs to be something which the author of the hub determines content for. Otherwise it needs to be very clear that this is HubPages saying this is recommended content and NOT the author of the hub. I’m saying this because I have cringed at some of the hubs being recommended on my hubs. If I had my way there is absolutely no way some hubs would be seen on mine simply because they were classified in the same way or were about the same topic. Obviously there are many that are fine – but IMO there needs to be a way that hub authors can exercise more editorial control. I was never very clear what “Related Search” meant and whether or not these were ads – and never dared click on them in case I infringed Google’s AdSense terms and conditions! I thought the whole point of the rules and guidelines on adverts these days is that it MUST be absolutely transparent when an advert is an advert? This looks fantastic, I like how clean the look is compared to now. I like it, looks very clean and modern. Increasing the content width is also a good call, I think. HubPages already has a nice mobile theme, and desktop users these days are usually using high resolution monitors. With Ads being removed from the main content area, readers will not be distracted. Good changes. Not to quibble, but the “new” page layout isn’t really “new”, but more a return to how hubs used to look before the powers that be decided to squish content into the center, leaving graphically UNpleasing empty space at the sides, and to marginalize hub authors by shrinking their avatars to the point they were unrecognizable without a magnifying glass. For many of us, our avatars are our brand as much as the Golden Arches are McDonald’s. Glad to see a modicum of common sense is returning to HP. I am excited to hear this! Brilliant changes. Thrilled to know the “related search” section will be removed. So far – the changes are looking good! Does look neater and cleaner. Widening the main body of the hub and doing away with th related searches are good fixes. It will look so much nicer to have the entire hub larger, without so much white space on each side of it. A great improvement. Glad to find you as I just signed up to HubPages today and all I kept reading were old or really outdated articles. I hope to create great articles and learn from the community. When I look at my hubs, what I see is a lot of blank space on the left and my article on the far right, looking pretty much the way it did before. Maybe you’re doing the hubs in lots and haven’t gotten to mine yet. The design ideas sound good. Great i am waiting ..